Philadelphia’s Red Means Run released their debut EP ‘All Things Said & Done‘ in 2014. Beneath the homespun recording sound, unfussy guitar work and occasionally wobbly vocals, there was a band who so clearly loved roots music and were keen to help keep Americana music traditions alive. Two years on, their ‘Love of Blindness’ EP represents a very, very welcome return. On this second outing, the vocals retain their same unfiltered and unpolished qualities, but much like their hero Neil Young’s approach from 1970 on, on some tracks, that roughness only adds to the charm. Like many of the greatest Americana acts, it’s the song writing that counts the most…and Red Means Run tackle these songs with a sense of love and understanding that no amount of polish would ever change. In a surprisingly upbeat mood, ‘Between The Lines’ rattles along like a cross between an old railway train and a barn dance, it’s influence from early Uncle Tupelo screaming through every bar. Ryan Wells’s tenor vocals don’t quite approach the tune with the typical or expected grit, but the addition of a strong harmony vocal really peps his performance. The rhythm section, meanwhile, seem like old hands with the style as a walking bassline and pleasant shuffle from the drums keep the pace. An occasional harmonica presence gives a nod to their love of Neil Young and his ilk, before the track finishes with a very busy guitar part. It might take a few plays to sink in, but the ideas within the number’s construction are strong enough. Changing the mood for inebriated heartbreak, the almost waltzing ‘Whiskey & Roses’ is a well-crafted “crying in your beer” epic that makes a bigger feature of Craig Newschaffer’s solid bass work while the rest of the band wander through the shadows of old country, albeit with the increase in guitar volumes reminiscent of Son Volt and the earliest Wilco outpourings. Although the members of Red Means Run hit the mark throughout, it’s guest artiste Mike Brenner who really shines: his pedal steel guitar cries with the ghosts of tradition, it’s wailing and syrupy sound providing the perfect addition to this country composition. As if to counterbalance the more country elements, ‘No Need To Look Back’ picks up the pace and pays homage to the most country parts of the first two Gin Blossoms records in a style that might also befit Denny Smith and The Great Affairs. There are few nice guitar flourishes and a very strong chorus, but the quicker pace really exposes Wells’s vocal imperfections. It’s by no means a bad track – Jim McKay raises the bar with a thoughtful guitar solo – but it’s definitely ‘Love of Blindness’s weakest link. In lots of ways, those tracks are enjoyable (warts ‘n’ all), but it’s the final pairing that help make a stronger case for ‘Love of Blindness’ being a better work than the debut EP. Taking a sidestep from their more country roots, the title cut opens with a ripping bluesy guitar run that makes things seem as if Red Means Run are about to indulge in a bit of the ol’ Texas blues, Stevie Ray style – but quickly enough the tune drops into a slow two-step that allows the country influences to leak through. The vocal meter (and occasionally the tone) resembles something from Neil Young’s oft-overlooked ‘American Stars & Bars’ LP, with Ryan backed by some pretty casual harmonies whist the rock edge of the music drives everything forward. There’s a lot to like within this number’s simplicity, but it’s guitarist Jim who steals the show, dropping his distinctive intro riff between verses and eventually stepping up for a cracking solo. 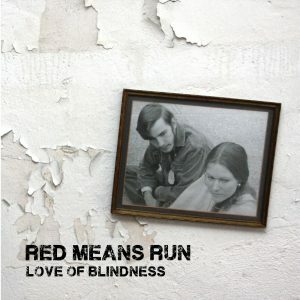 At various points, it seems as if Red Means Run have genuinely peaked, but with more to give, the EP’s best track is saved for last… ‘Headlights’ is a guitar heavy, swaying and rolling retro beast that contains an obvious influence from Uncle Tupelo’s ‘Whiskey Bottle’; it’s a tune that allows Jim plenty of space for long wavering notes. The crying sound from his guitar is of almost as much importance as the song’s protagonist who tells us all of a dark “lonely road” that he’s travelled upon many a time. The combination of mumbling voice, steady rhythm and melodic guitar work comes together in a way that could possibly help a rock based audience connect with the roots, but without losing too much sight of the Americana sounds that Red Means Run so clearly hold so close. If you’ve never heard ‘Whiskey Bottle’, be sure to check it out…and if you’re a Tupelo fan, this might just raise a wry smile. This entry was posted in Album & EP Reviews and tagged americana, red means run, retro, stream by Real Gone. Bookmark the permalink.